The way in which Parliament exercises control over the Executive, whether under a Presidential system or under a Prime Minister in Parliament, is through Committees. But the financial oversight committees turned into jokes and though, under the Chairmanship of D E W Gunasekara, COPE has achieved a certain amount, it is still far too little. There are no systems for follow up, and little willingness to set these up. The Consultative Committees are much worse. And most culpable of all are the members of the Opposition who hardly ever attend. Recently, I was the only person present apart from the Minister at the Consultative Committee on National Languages and Social Integration, which is astonishing, given how important these subjects are, and in particular for the TNA. They were also conspicuous by their absence at the meeting of the Consultative Committee on Resettlement, which is behavior I find astonishingly irresponsible. Fortunately, for once I was not the only person to raise issues, and two of the government members present drew attention to serious issues – though one did note that he would not have complained so vociferously of abuses had the opposition been present. There may however be good reason for the opposition absenting itself, since meetings are so sporadic that there is little chance of follow up. The Resettlement Ministry Committee was meeting after nine months. Education, which is of interest to everyone, and which generally draws a larger number – though in fact the only members of the Committee present were Sajith Premadasa (who is both conscientious and articulate) and myself – met after three months. The reaction of one government member to my efforts to ensure follow up suggest how utterly unfit many of our Parliamentarians are to exercise the traditional responsibilities of Parliamentarians. He claimed that only members who raised issues could ask follow up questions, and the Minister of Education tried to uphold that point until both Sajith Premadasa and I pointed out how idiotic the idea was. The whole point of a Committee is to discuss matters in terms of general principles, and if all that was intended was for individuals to find solutions to their parochial problems, then there is no need of a Committee. Sadly most of my colleagues do think Consultative Committees are for parochial purposes, and they raise issues such as the admission of individual children to particular schools. So matters such as the failure of the Ministry to provide sufficient English and Science and Maths teachers, the waste of putting up buildings and equipping them with computers and then keeping them shut until a politician finds the time to open the building, the failure to ensure extra-curricular activities in rural schools, are all neglected, while we are told about why a particular Zonal Director of Education was, or was not, transferred. I have tried to find remedies for this gross neglect through Amendments to the Standing Orders, but the Speaker has obviously not been advised properly, since he failed to put the proposal to the House, which is what Standing Orders require. It should then go to the Committee on Standing Orders, but the Speaker fobbed off those in the Business Committee who asked what was happening, by saying he would convene the Committee. I had long had a good opinion of the Speaker, since he tries to be fair, and has also drawn the attention of both Ministers and the President to the belittling of Parliament by Ministers not being present to answer questions. But it seems that this is mere verbiage, that comes out when he is upset by particularly gross neglect. The mood then passes, and he has neither the inclination nor the capacity to take remedial action. I have suggested solutions in my Amendments to the Standing Orders, but I suspect he has not even looked at them, and I do not think his staff is in a position to explain such matters to him. That he does not really take structures and systems seriously is apparent from the fact that the Committee on Standing Orders has not met for nearly four years. But then, his lethargy is understandable, since I think I am the only person who has asked him about this, orally and in writing. The Chief Opposition Whip has a wonderful capacity for opening his mouth wide when his attention is drawn to something important, and he has granted that he should have done something, but then he evidently forgot about the business again. And Mr Sumanthiran, who was a tower of strength in the few months in which the Committee did meet, seems to have forgotten all about it, though he does grant that useful work was done then. Three years ago, when a Parliamentary delegation visited India, we spent much time with the Minister of Parliamentary Affairs, who perhaps had been briefed about how hopeless our Parliament had become, since he briefed us on the systems they were using in Delhi to ensure more effective performance by Committees. These included clustering similar subjects together, which is even more essential in Sri Lanka, given the absurd proliferation of Ministries. One excuse offered by the administration for failing to schedule meetings is that there is insufficient space, but this can be resolved by grouping Ministries – which would also be more productive, given the overlap in functions. Another problem is that many Ministers are not interested in having meetings regularly. But in other countries it is not the Minister who chairs or convenes the meeting, but a Parliamentarian who is not part of the Executive. This is obviously sensible, since the point of the Committees is oversight of the Executive, but as I have often noted, Sri Lanka simply cannot understand that it makes no sense to allow an institution to monitor its own work. Almost immediately after I became a Member of Parliament, I sent the President a proposal for oversight committees, which I had discussed with the Secretary General of the Inter Parliamentary Union. I had known him earlier through my father, and then I met him often in the days when I went to Geneva for the Human Rights Council. 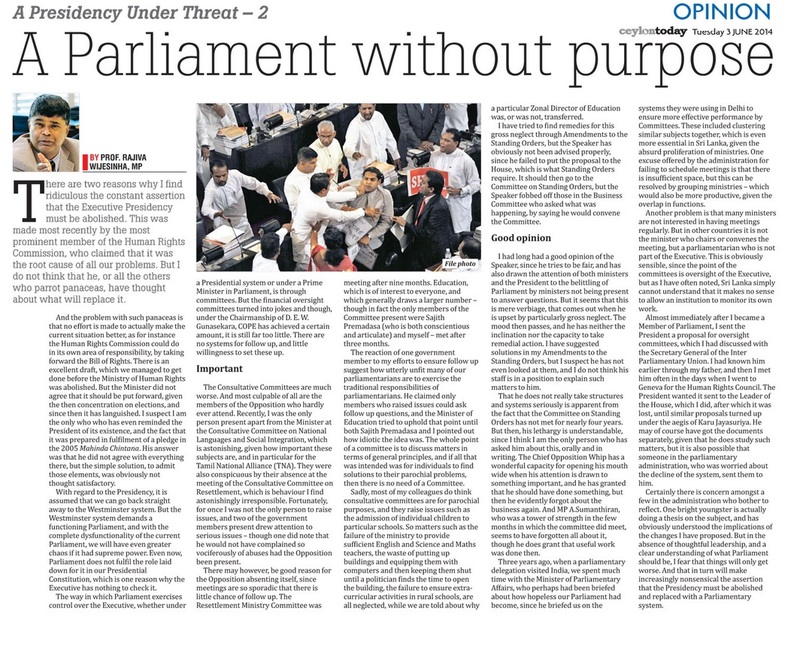 The President wanted it sent to the Leader of the House, which I did, after which it was lost, until similar proposals turned up under the aegis of Karu Jayasuriya. He may of course have got the documents separately, given that he does study such matters, but it is also possible that someone in the Parliamentary administration, who was worried about the decline of the system, sent them to him. Certainly there is concern amongst a few in the administration who bother to reflect. One bright youngster is actually doing a thesis on the subject, and has obviously understood the implications of the changes I have proposed. But in the absence of thoughtful leadership, and a clear understanding of what Parliament should be, I fear that things will only get worse. And that in turn will make increasingly nonsensical the assertion that the Presidency must be abolished and replaced with a Parliamentary system.